15 budget friendly and super fun & creative bachelorette party ideas! Don’t let that ‘super luxury destination bachelorette trip’ that you see on Instagram get to you. Celebrating your last few ‘singlehood’ days with your girls doesn’t have to necessarily cost you and the rest of your squad a fortune! 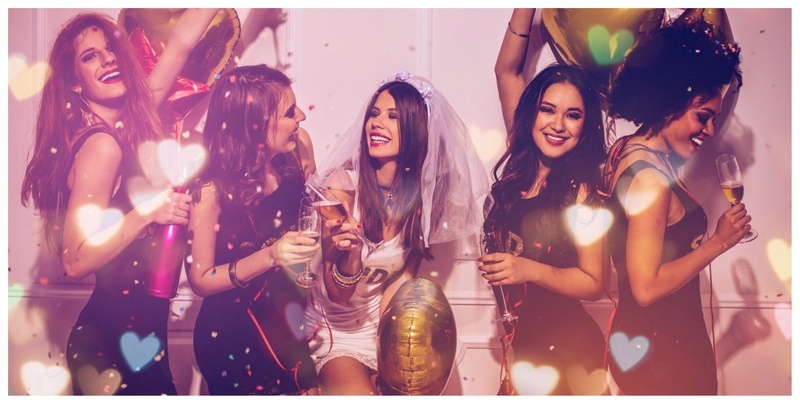 Hosting your bachelorette party in your budget & at the same time having a great time can go hand in hand. Recapture all those glam and glory days of your teen years, and throw the coolest slumber party ever. I am thinking silk robes, champagne, fun games or cue up your favorite movies for the night and stack the pinots and merlots in abundance. Get your girl squad together for a weekend escape. I am talking about a cabin in the woods or camping under the stars. Sounds awesome right? Throw in some fun bachelorette party games, a day trip to a nearby spa or small town, and, of course, a lot of cocktails. And just because you're out of the city doesn't mean you can't have your 7 course meal. Arrange a private seating from the best local restaurant and experience some fine-dining in style! Not every bachelorette party has to be a cray-cray night out on the town, especially if it's way too near to the D-day. Instead you can opt for a spa-cation to calm some of those pre-wedding jitters. Also, if you don’t feel like travelling to the spa, companies like Urbanclap create customized spa days in the comfort of your home . Don't let the traveling aspect fool you, though; they still offer massages, facials and body treatments to boot. Have a caterer come in to create a gourmet meal along with some cucumber-infused cocktails or just schedule a beauty session, have them pamper you with professional makeup and hair services before hitting the town. Always wanted to go zip-lining, parasailing or maybe even bungee jumping? Think of your bachelorette as an opportunity to try something new and thrilling. You don’t have to go to live near Napa to enjoy some seriously good Cab or be Portland to indulge in your love of craft beer. These days you’ll find a lot of wineries and breweries nearby to you where you can surrender to the tase. To make things more fun, you can have every guest bring in a different bottle of wine, have your girlies sit with blindfolds on and have each guest guess which wine is what. To take things up a notch, introduce some fun and naughty nibbles. Can’t get to Coachella in your budget? Well then pack your bags to Sunburn Goa which also offers the top artists of the country. Make a weekend out of with with a house rental that's stocked with plenty of snacks and libations for a few days of fun. For all the sea-lovers out there, this will def be your favourite way to spend your bachelorette. Rent out a small yacht or speedboat and take your girl squad out for the day. I'm thinking #BrideTribe swimsuits too? Not only will it give the bride a chance to get a bit of a natural glow started before the honeymoon, but you'll also have plenty of time to bond out on the water. Coordinate cocktails accordingly, an ocean breeze is an pairs perfectly with tropical juices and rum drinks. You’ll always have Vegas, but if you don’t wanna burn a really big hole in the pocket, there’s also, Lonavala, Pondicherry, Manali and Darjeeling. Pick a closer home option, and plan a mini vacation to either of these places. Make it a bachelorette trip and lose yourselves in that long drive and you’ll thank yourself for that decision by the end of the trip! And lastly, never ever underestimate the a limo-ride that leads to a pub, followed by lots of drinking and getting up with some good and some embarrassing memories. After all, your last night as a single gal doesn't come everyday! So, what are you waiting for, get that party planning started already! All Gifs are taken from Giphy.com.